The Hug Bed & Crash Pad is an affordable, safe, durable, comforting solution for kids and adults with autism, Asperger's syndrome, fibromyalgia, lupus, and many other physical disabilities and special needs. The Hug Bed & Crash Pad comes in all five standard mattress sizes: 39" x 75" Twin, 54" x 75" Full , and 60" x 80" Queen, 76" x 80" Eastern King, and 72" x 84" California King. Custom sizes are also available by Contacting Us. 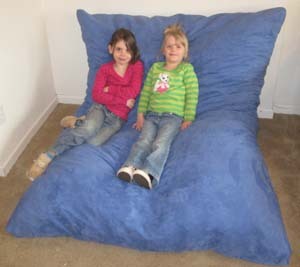 This unique piece of pillow furniture can be used in a number of versatile positions, whether it is flat as a resting bed, as a full comforting lounger against a wall, folded lengthwise as a couch, or tipped on its edge, creating a giant hug chair. It also makes a fantastic crash pad for people of all sizes! The Hug Bed & Crash Pad is made from stain-resistant, sturdy microfiber fabric and is filled with our special cut foam, which creates an air and foam combination to offer a unique supportive, secure and comforting sensation... like a firm warm hug! The suede like feel and soothing primary colors of our microfiber fabrics are very pleasing to the senses and go well with any environment. Zippered, removable covers are also available for all Hug Bed & Crash Pad sizes, which can be upgraded with a water-resistant liner on one side for additional protection against spills and leaks. The Hug Bed & Crash Pad is also a very safe solution to your furniture needs, there are no sharp corners or wood to be injured on. 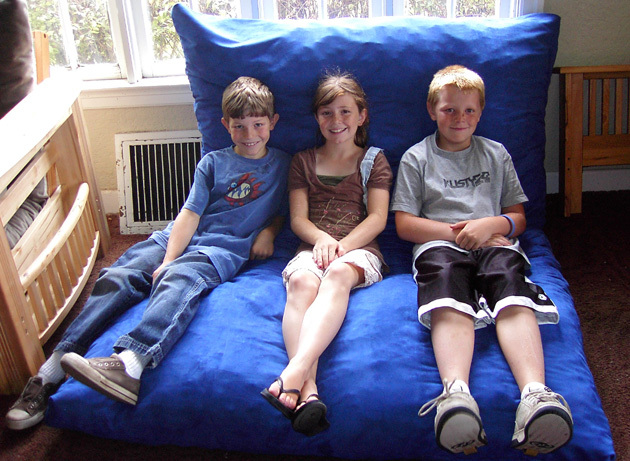 The Hug Bed & Crash Pad is the perfect solution to your special needs! 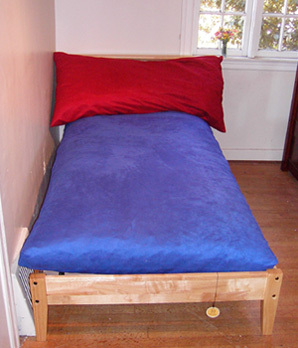 A Hug Bed & Crash Pad in sea blue microfiber, shown with a red microfiber body pillow. The Thyme Twin basic bed shown in natural wood is also available from Robb's Pillow Furniture & Futons. See what our customers have to say about the revolutionary Hug Bed & Crash Pad! The Hug Bed & Crash Pad can also be vacuum packed for quick shipping and a great surprise! 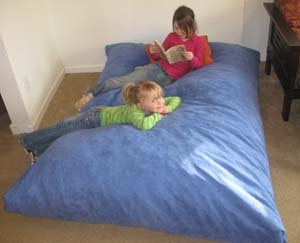 A full size sea blue Hug Bed & Crash Pad shown in the lounger position.